Khyar bi laban is a traditional Middle Eastern cucumber salad made with yogurt. It is similar to the popular Greek tzatziki dip. This cucumber yogurt salad is traditionally made with fresh, strained yogurt made from goat’s milk, which generally has a deeper and richer taste than its cow’s milk counterpart. But plain Greek yogurt is also a great option that’s more readily available in the United States. Khyar bi laban is a vegetarian favorite, often served as a snack or appetizer with bread or fresh vegetable sticks for dipping. But the dip is not limited to the vegetarian recipes. 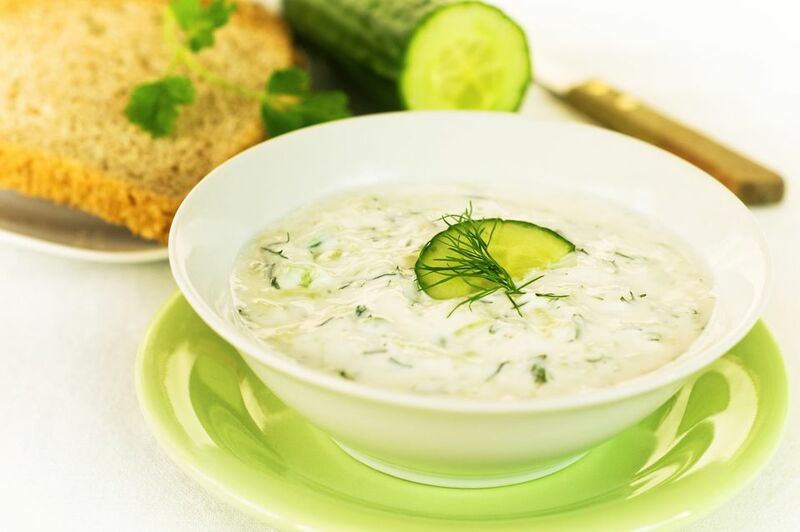 The cucumber yogurt salad is also served as a thick sauce with meat dishes and is particularly favored with lamb dishes. Another reason this recipe is a favorite is that it is incredibly simple. Made with only five fresh ingredients, khyar bi laban is a refreshing and surprisingly flavorful dish. To top it off, it’s a healthy snack option! Peel and slice cucumbers into thin rounds. Place sliced cucumbers in a strainer and sprinkle with salt. Set aside. While salted cucumber slices sit, crush garlic and mash together with fresh mint leaves using a mortar and pestle or wooden spoon. Combine yogurt and garlic mint mixture together. Stir well. Fold in cucumber slices and serve cold. Leftover fresh mint leaves can be used as a natural and colorful garnish on top of the dish. Though the dip is ready to be served immediately, allowing the ingredients time to infuse makes for an even better salad. Chill in refrigerator for 1 to 2 hours for best results. While you can use any plain yogurt of your choosing, we suggest a strained yogurt for a thicker and more rice dip. And if you’re feeling adventurous, consider making your own homemade Greek-style yogurt for an exceptionally fresh dip with no preservatives! Cucumbers can also be quartered lengthwise and then chopped into thin, small pieces instead of round slices. The shape is simply a matter of preference.